Church leader defended women after police arrested men at embattled institution. JUBA, South Sudan (Morning Star News) – A church elder on Monday (April 3) died from injuries sustained in a raid on an embattled Christian school by supporters of a Muslim business interest in Omdurman, Sudan, sources said. 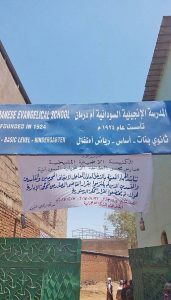 Younan Abdullah, an elder with Bahri Evangelical Church, died in a hospital after being stabbed while he and others were defending women at the Evangelical School of Sudan, Sudan Presbyterian Evangelical Church (SPEC) sources told Morning Star News. Christians had staged a protest against the attempted seizure of the school by a Muslim businessman, they said. Police from the Omdurman Central Division along with a group supported by Sudan’s Ministry of Guidance and Religious Endowment arrived at the school first and arrested all the men in an attempt to hand it over to the businessman, they said. Advocacy group Middle East Concern (MEC) confirmed that after the arrests, about 20 men, including members of a committee the government has illegally imposed on the SPEC, arrived at the school with knives and other weapons and began to beat the women. Elder Abdullah later died of his injuries, and a second church member, Ayoub Kumama, was treated at a nearby hospital and has been released, according to MEC. Abdullah is survived by his wife and two young children. Since 2013, the illegally imposed committee has been selling church properties to businessmen aligned with the government, the advocacy group stated. Police were present during the attack on the school but failed to intervene, according to MEC. Christians held a funeral service for Abdullah yesterday (April 4) at the school, which had declared three days of mourning. The U.S. Ambassador to Sudan and the Second Secretary of the British Embassy were present, according to MEC. 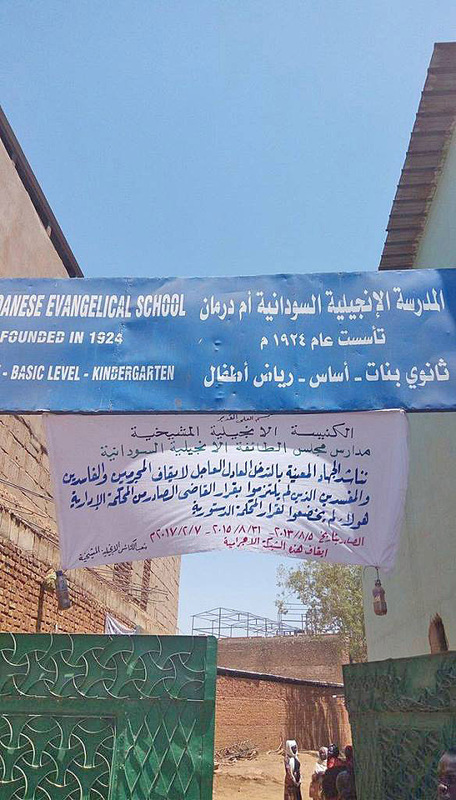 Police in Omdurman, across from Khartoum on the Nile River, on March 27 had arrested 12 staff members of the Christian school and the next day prevented others from leaving the campus, they said. They were taken to Omdurman’s central division police station and released at about 8 p.m., accused of obstructing the work of Education Vision, which is trying to take over the school. The institution is still functioning as a Christian school, but representatives of Education Vision are regularly disrupting classes, school personnel said. On March 16 about 20 policemen aboard a truck forcefully entered the school compound, arrested three Christian teachers including the headmaster, Daud Musa, and took them to Omdurman’s central division police station, sources said. Also arrested were Christian teachers Yahya Elias and elder Abdullah, all of the SPEC. The arrests came nearly a month after authorities arrested and held overnight four educators from the same school, including Musa, before releasing them on bail. They were accused of destroying a sign belonging to Education Vision. The Christians strongly denied the accusation. The leadership of the SPEC remains in the hands of government-appointed committee members even after a court ruled in November 2016 that the appointments were illegal, sources said. That case is separate from an Aug. 31, 2015 ruling by the Administrative Court of Appeal saying the Ministry of Guidance and Religious Endowments interfered with SPEC’s Khartoum Bahri Evangelical Church by imposing committees on the church in order to enable Muslim investors to take it over.